The Hon. Dr. Wilson is the 24th Secretary of the Air Force and is responsible for the affairs of the Department of the Air Force, including the organizing, training and equipping and providing for the welfare of 660,000 Active-Duty, Guard, Reserve and civilian forces their families. 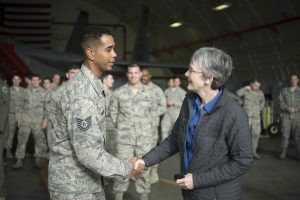 She oversees the Air Force’s annual budget of more than $132 billion and directs strategy and policy development, risk management, weapons acquisition, technology investments and human resource management across a global enterprise. Last year’s dinner featured a keynote address by the Chief of Naval Operations, Admiral John Richardson, who discussed the state of the U.S.-Japan alliance and the challenges of growing maritime competition in the Asia Pacific, and a speech by Admiral (ret.) Dennis Blair, former Director of National Intelligence and Commander of U.S. Pacific Command. RSVP details for this year’s dinner will be forthcoming. To receive your invitation, you must be a member of JUMP. If you aren’t already a member, sign up now: Join JUMP. The JUMP program seeks to bring together those American service members, government employees, and their families who have served in Japan and would like to remain in contact with the Japanese culture, language, and people, as well as stay informed about the U.S.-Japan alliance. The program is a collaboration between Sasakawa USA, the National Association of Japan America Societies (NAJAS), and the Embassy of Japan in Washington, D.C.